Darrel Ellis (1958-1992), a New York-based mixed media artist, started out making self-portraits until he discovered a cache of photographs his father, Thomas Ellis, had made in the 1950s. Ellis reworked them, using painting and drawing to explore identity within the family dynamic and to rewrite the familial narrative as a kind of self-therapy. 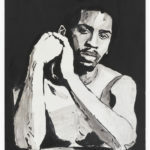 Ellis was a young and gifted New York artist of color who worked in photography, painting and sculptural forms- his life was cut short at the age of 33 by AIDS. He first received major public exposure in 1992 with his inclusion in New Photography 8 at The Museum of Modern Art, curated by Peter Galassi, which occurred one year after his first solo show at the gallery Baron/Boisante on 57th St. The MoMA show took place several months after Ellis' death in 1992. A major retrospective of Ellis' work was mounted in 1997 at Art in General, curated by the artist Allan Frame, Ellis's friend and later executor of his estate. The show was circulated to five American art museums.